After crashing hundreds of miles from civilisation in the Amazon rainforest, Fred, Con, Lila and Max are utterly alone and in grave danger. They have no food, no water and no chance of being rescued. But they are alive and they have hope. As they negotiate the wild jungle they begin to find signs that something - someone - has been there before them. Could there possibly be a way out after all? This is one of my favourite books and I have read a lot of books this book scary and times but a happy ending it is a long book but it is worth it. I would recommend this book to everyone. I thought this book was amazing, my favourite character was Con, because she is bossy and rude but that is only because she doesn't have a good background and she has photographic memory. She is actually a nice person once you get to know her. This is a lovely and heart-warming story of four children who survive a plane crash in the Brazilian Amazonian rainforest, and survive a series of challenging and sometimes life-threating situations to become strong friends and eventually find their way home. The descriptions of their surroundings, the sight, sounds, animals are rich and very realistic. You feel you really get to know the main characters very well. 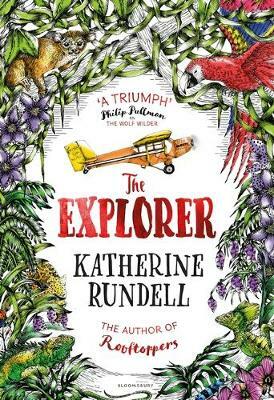 The Explorer is a thrilling adventure story about four children who get stuck in the Amazon rainforest. I thoroughly enjoyed this book and i would recommend it to anyone aged 9 - 11. An exciting adventer through the Amazon! It's a fictional book but this story is like real life, it's about four children and their plane crashes in the jungle so they have to figure out how to survive. I really like this book because it was a really big adventure. My favourite bit was when Fred drove a aeroplane. I didn’t read this for the challenge but still loved it! For 8-100yr olds anyone can enjoy this thrilling book about four kids lost in the jungle what will happen and has anyone been there before! Will they escape???? This story has a down to earth, realistic tone. It is a great adventure full of danger, wonder and friendship. It is about four children stranded in the jungle struggling to survive when all of a sudden they meet a very perplexing man. I liked this book because it is a little funny and interesting. it is a good book recomended for spooky readers. The Explorer is a thrilling adventure story that keeps you gripped the whole way through. Four children get stuck in the Amazon rainforest when their plane crashes and have to survive. Then they meet the Explorer. It is an exciting read that I would recommend to anyone who likes adventures. An amazing read. Four children lost in the Amazon rainforest on their own. Will they survive? I recommend this to anyone who is learning about South America or rainforests or those who love adventure.